After several days of feeling unwell, fighting fevers, exhibiting bruises and not eating, Simi’s alarmed parents took her to the local hospital. The physician in the Emergency Department told Simi’s parents “She might have cancer. You need to get her to SickKids immediately”. The news was such a shock that Simi’s mother fainted right then and there. Upon arrival at Toronto’s Hospital for Sick Children (SickKids), on October 22, 2018, Simi was immediately transferred to the Intensive Care Unit where she spent the night and most of the next day. 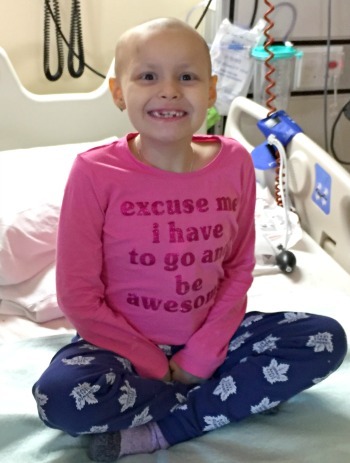 Her parents learned that she had acute myeloid leukemia, AML, is a cancer of the blood and the bone marrow. She was transferred to the hospital’s oncology ward where she met the members of her health care team and learned what was in store. AML is treated with a very intensified course of chemotherapy over a short period of time (usually five to six months). Because the treatment is so intense AML patients are at increased risk of contracting infections and spend almost the entire course of their treatment in-hospital. While Simi has had occasional breaks between courses of chemo she has been living in-hospital almost continually since late October 2018. Her twin sister Esther visits as often as possible but because Simi is at risk of developing infections during her chemotherapy treatment their visits are not as frequent as both girls would like. Simi has developed special friendships throughout the hospital. She loves visits from the therapeutic clown, the Child Life specialists and her school teacher. She is a ball of fire. Loves to keep busy with crafts and activities and looks forward one day to being well enough to learn how to play hockey. She has two career goals at the moment and is weighing her options. She might want to be a doctor to help other children with diseases like leukemia. Or, she might want to own a nail salon. Knowing this spitfire it’s entirely possible that she could pursue both career options simultaneously.